The NRA Basic Rifle Shooting course taught at our facility enables students to shoot a variety of rifles including the Bushmaster ACR with a EOTech EXPS3-0 Transverse Law Enforcement and Military Night Vision Holographic Red Dot Sight 65 MOA Circle. The ACR is currently offered to military and civilian personnel in .223 Rem/5.56. Bushmaster expects to have kits available soon to switch the caliber of the rifle to 6.8mm Rem SPC and 7.62x39mm just by replacing the barrel, bolt carrier, and magazine. Other calibers are also being considered. It is also expected that the ACR will have barrel length options of 10.5″, 12.5″, 14.5″, 16″ (commercial), and 18″. 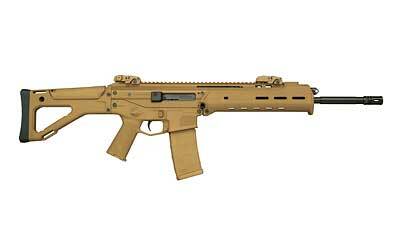 The following is taken from an article titled "The Bushmaster ACR" by By Glenn M. Gilbert. The link for the full article in American Rifleman is below. The ACR’s construction and design are rugged and reliable, but they are not revolutionary. Most of the components and operating principles, such as the heavy bolt and indirect gas-impingement operating system, are designs with proven histories, but what really sets the ACR apart from older designs are its ergonomics. For example, both the magazine release and the bolt stop buttons can be worked with the trigger finger, and they are also completely ambidextrous. Mirrored magazine release buttons can be found on both sides of the lower receiver just above the front of the trigger well. The buttons are large, square and grooved for easy activation and fenced to reduce the chances of their being accidentally depressed. The bolt stop release is located between the front of the trigger well and the rear of the magazine well, the bolt stop releases have a stepped contour that leaves them raised at their centers. Pushing up on either button engages the bolt stop. Pressing down releases it. Additionally, the rising follower of an empty magazine automatically activates the bolt stop, so the bolt stays open after the last round is fired. The ambidextrous safety lever can be worked with the thumb of the firing hand. The safety lever rotates easily throughout its 90-degree travel without binding, yet it positively engages both the “safe” and “fire” settings. The ACR comes with Magpul MBUS back-up sights. They fold down when not in use, but wings on both sides of the front and rear sights can be quickly deployed with the thumbs of the firer’s shooting and support hands. The rear aperture is screw-adjustable for windage and the front post can be adjusted for elevation with the tip of a bullet or a special purpose tool. The rear sight has two apertures. The smaller aperture is optimized for 100 to 300 meters, and the larger aperture is intended for what the manual calls “Short Range,” or out to 100 meters. Remington developed a proprietary finish for use in both the Remington and Bushmaster ACRs. Impregnated with a dry lubricant, the new finish will be applied to the inside of the bore and to all of the working components of the gun. Remington claims the new finish resists corrosion and doubles the service life of the bore. Additionally, it dispenses with the need for any additional lubrication. Needless to say, this limits the accumulation of carbon- and environment-based fouling. The gun certainly delivers on performance and handling, and given the speed with which one can change the barrel, it is certainly adaptable.